On August 10th, Al Forte will be interviewed on the live CatholicTV talk show “This is the Day”. Forte plans to walk from Boston to New York City starting on August 23rd in an effort to promote peace. 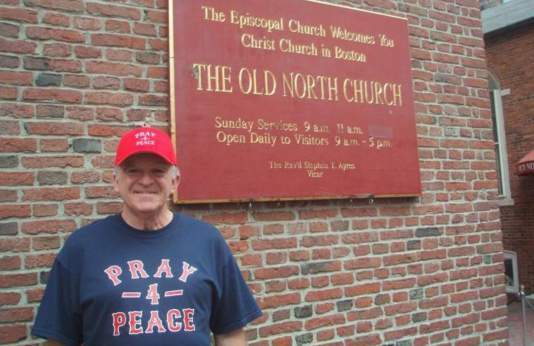 Al Forte will walk from Fenway Park in Boston to Yankee Stadium in New York City from August 23rd to September 24th. Forte was originally inspired to do a prayer walk one morning while attending daily Mass. He has already walked from New York City to Chicago. During this walk, he handed out over 3,000 prayer cards. His walks have been covered by more than a dozen newspapers. Lisa Mladinich will also be interviewed on This is the Day. Lisa teaches a workshop called “You Can Be an Amazing Catechist” and also authored the book “Be an Amazing Catechist: Inspire the Faith of Children”.